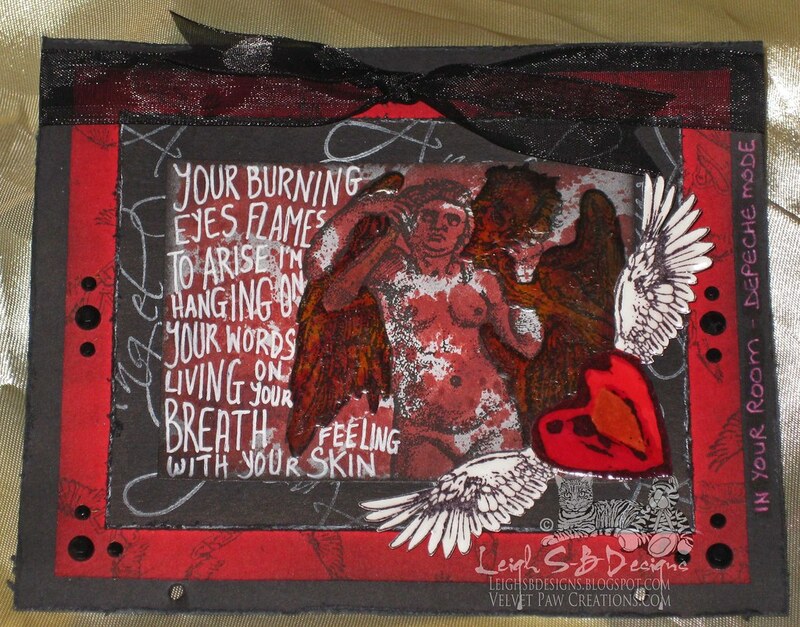 Velvet Paw Creations: S&S Bloody Valentine Book and Page Three "Burning Angel"
S&S Bloody Valentine Book and Page Three "Burning Angel"
Welcome to Day 3 and the finale of the Smeared and Smudged "Bloody Valentine" Blog Hop! Here's Page 3 plus a look at my finished book featuring stamps from Smeared Ink. The inspiration for today's page is another Depeche Mode song titled "In Your Room". Continuing on from yesterday's post...this ATC started out white but this time I only dabbed Fired Brick Distress Stain onto a craft sheet and pressed the ATC into it to get the bright blood splattered effect. The image from Smeared Ink's "As Death" rubber set was stamped with Onyx Black Versafine ink and the skeletal angel was coloured with Dried Marigold Distress Marker before I applied Inkssentials Matte Accents to make him stand out. The text was handwritten with a white gel pen. I stamped the word 'Angel" in White Cloud VersaMagic ink around the edges of the smaller black mat. Two Winged Hearts from Smeared Ink's Heart Wings rubber set were coloured and coated the same as the others and adhered to the page and to the back cover with a dab of Silicone dimensional glue. 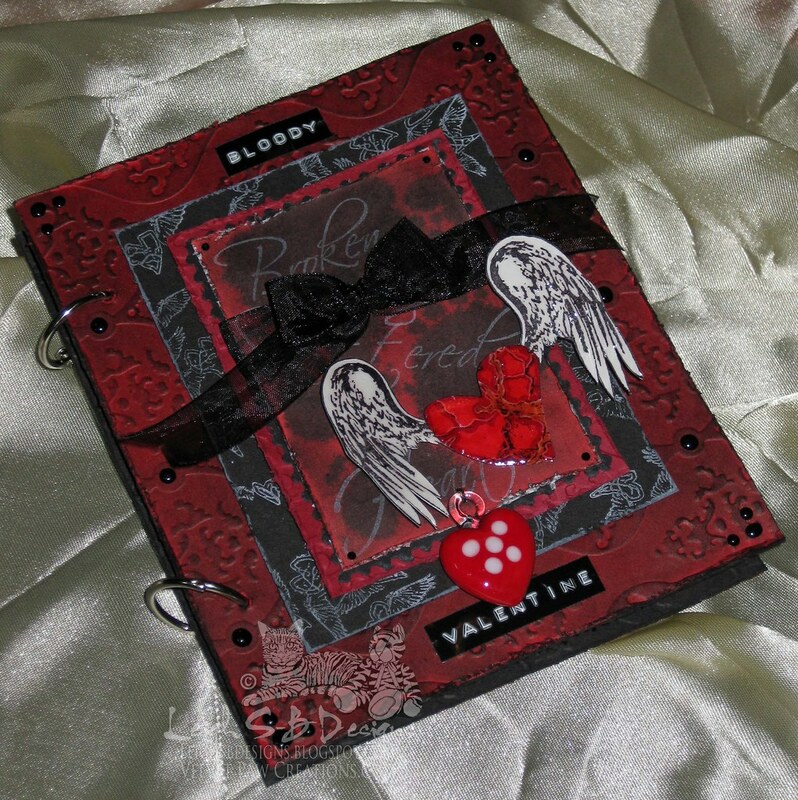 All of the red mats and the black one on the book cover were stamped with Smeared Ink's flock of flying hearts stamp. The backing for all the pages and the book covers were all embossed with Craftwell's 8.5 x 11" Regency embossing folder which I ran through my eBosser machine (available at Crafter's Companion). All were distressed with Tim's Paper Distresser tool and the red ones treated with Black Soot Distress Ink. I embellished the front and back covers with Inkssentials Black Enamel Accents and made the book title on my Dymo Buddy Label Maker. Thanks for visiting and leaving all your wonderful comments! I hope you enjoyed seeing my dark and twisty projects ;0) You've still got a few more blogs to visit so off you go, the Blog Roll is there on the right! Don't forget that my DominoART Blog's Romancing the DominoART event starts Feb 14th! I'm accepting new players throughout the event so email me your altered game piece art! Click the banner below to check out all the details and show us your romantic side DominoART style and join the fun! 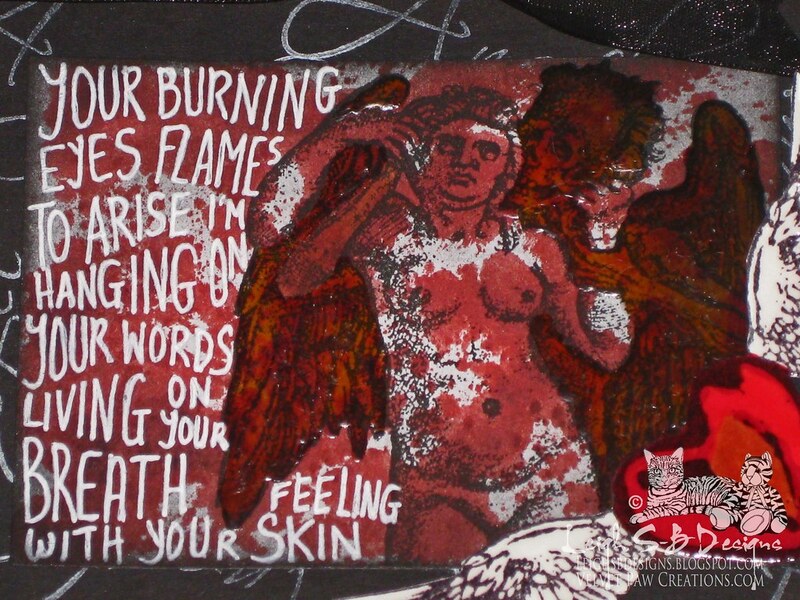 Wow Leigh...you created an ATC masterpiece. Love the covers and pages. I really enjoyed visiting your blog for the hop! Now I'm going to use your link and check out the dominoes! Absolutely gorgeous book - so many details, great colors and contrasts, embossed backgrounds and wonderful design. Super awesome! Wow! I am too gobsmacked for words! I need to stalk you more often to pick-up some tips and tricks. I am in total awe of your work. Everything you make is pure perfection! I just want to hold your book in my hands to feel the textures and to examine all of the luscious details up close.